Sales for smartphones and tablets have outpaced personal computers by leaps and bounds for years now. As mobile technology becomes more efficient and affordable, the trend will continue to grow. If you still have an old-fashioned website, a Flash website, or a website that is otherwise not mobile friendly, it’s time to change that now. Like, right now. Mobile responsive defined: When a website is responsive, the layout and/or content responds or adapts based on the size of screen they are presented on. If you don’t know what your website looks like on a smartphone, chances are you’re not mobile-friendly. Here are a few tips to get started with a mobile responsive site. If you’re shopping around or looking to update your website, there are a number of considerations. One of the first things is to figure out which platform to use. In today’s digital age, I primarily recommend a platform like WordPress or Squarespace for setting up your website. If you’re an ecommerce business selling of physical goods, you might hear me recommend Shopify. These sites have goo gobs of mobile responsive themes so you’re good to go from the get go. Self-hosted WordPress has some wonderful themes that are mobile friendly. They’re easy to install. You just need to pick one and use it on your website to become a mobile friendly destination for your followers and readers. The more simple your website, the easier it is to read on a mobile device. Avoid flashy and (Flash) pictures and images. If you can disable popups on the mobile version of your site, even better. Yess, I know popups work and they help you to build your list. The problem is that most popups show poorly on mobile. You can’t see the little ‘X’ to close the popup, so your visitor can’t view your content and they get annoyed. Don’t annoy your mobile viewers; opt for embedded sign up forms instead. Now back to the “Go Mobile or Go Broke” part of this post. Your website needs to look good across all digital devices. This may sound like too much of a major overhaul for your website, or it may sound too complicated. If you’re in the business of being in business, it’s time for your website to grow up my friend! Don’t lose out of opportunities and profits because your website looks a hot mess on a smartphone. 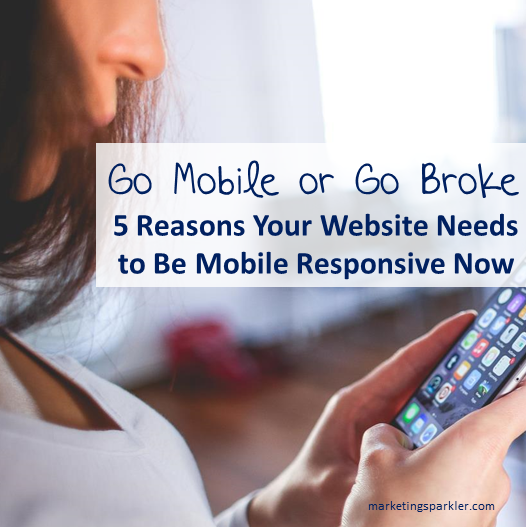 If you need further convincing that it’s time to invest in a mobile responsive design, here are five reasons why your website needs to be mobile now. Are you reading this post on your phone/tablet or a laptop? When is the last time your phone left your sight? Do you sleep with your phone within arm’s reach? What is the one device you don’t leave home without? The reason for this pop quiz is simple: I want you to think about how much you use your phone every day. Guess what? Your customer is using mobile technology most of the day too! They have their phone near them at all times, probably even take their phone to bed with them. Your customer wants your website to work the same on their mobile device as it does on their PC. Don’t you have the same expectation when you visit websites? According to DudaMobile.com, 1 in 5 website visits using a mobile device leads to the user calling the business right away. Mobile users are looking for you right now, and will contact you if needed, right now. Not later when they get home to their PCs. In fact, they might get frustrated and not visit you again at all. The awesome thing about mobile friendly websites is they actually look a lot better on a PC than websites that aren’t mobile friendly. This makes having a mobile friendly website even better because you no longer have to have two separate sites. They look clean, are very user-friendly, and load fast. If you’re using social media as a marketing tactic and you don’t have a mobile website, you’re making a huge mistake. Most people who are on social media are using their smartphones and tablets to use that social media. Did you know: 56.5% of Facebook users only use Facebook on their mobile. People who use social media want the same experience as they had on their PC. Some people are even getting rid of their traditional PCs. Your customers are impressed by working mobile websites and will often speak poorly of websites that aren’t mobile friendly. Even if you’re in a demographic yourself that isn’t mobile, you have to realize that anyone under 45 is mobile today. It’s normal and natural to them to use their phones as computers. If you want to improve your brand’s image, go mobile. Finally, if you want to reach your customer, ensure that your website is mobile, as well as any email newsletters you send them. Consumers are more likely to read your emails via their smartphone than they are to read them on their PC, so it’s time to get mobile, now. I’m curious, do you get more website traffic from desktop or mobile? My files are more important,it is my life! Better follow your suggestion just to be safe. HAHA!